Actress Raveena Tandon is in Hyderabad and so are some of the Baahubali stars. So, why not catch up? Who invited who to the party is not known, but we are extremely glad with the end result. 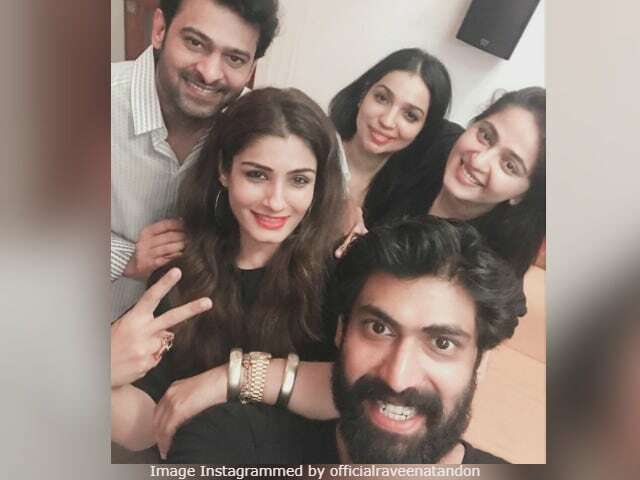 The actress caught up with Prabhas, Rana Daggubati and Anushka Shetty - all prominent Baahubali actors - on Saturday for a party in Hyderabad and shared a million dollar worth of selfie on Instagram. From the tags accompanying Raveena's post, we know that she had a great time with her friends from the Baahubali franchise and enjoyed a scrumptious spread of the Hyderabadi cuisine. Brownie points to Raveena Tandon for making Baahubali and Bhallala Deva smile together in one frame (if you know what we mean). Posted on Sunday morning, the selfie has garnered 200 comments and over 45,873 likes in less than seven hours. And, oh, it appears that courtesy for the selfie actually goes to Rana Daggubati. In both parts of the Baahubali epic series, Rana played the antagonist Bhallaladeva while Prabhas featured in the titular role. Fans and followers are delighted to have seen so many of their favourite celebrities at once and have been flooding the comments thread like this: "Wow, that's too many people I like in the same picture," said one user while: "Happy to see all of them together. Thanks for the pic," said another. Having wrapped Baahubali on a blockbuster note this year, the cast is busy with their respective projects. Prabhas will next be seen in Saaho, an action thriller he co-stars with Shraddha Kapoor in. Rana Daggubati was recently seen in Telugu political thriller Nene Raju Nene Mantri. Raveena Tandon was last seen in Onir's romantic drama Shab.